The tables present SSI data by eligibility category (aged, blind, and disabled) and age. State data on the number of recipients and amount of payments are shown in Tables 1 and 2, respectively. 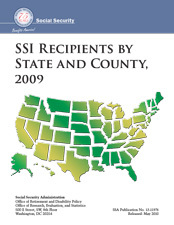 SSI recipients who also receive Social Security (Old-Age, Survivors, and Disability Insurance) benefits are shown in Table 1 and also in Table 3, which presents data at the county level. Beginning in 2009, Table 3 includes a column that lists the American National Standards Institute (ANSI) code assigned to each state and county.